Converse, the iconic American sneaker which has been in the Indian market since 2009, is getting its act together. It is now on par with the global brand, launching collections alongside the global timeline, stores are spruced up and the brand is finally getting the attention it deserves. According to Rachna Aggarwal, Converse is now fully on par with the global entity. She expects the brand to cross Rs100 crore this year. The customer today is far more demanding than he was five years ago. He / she wants a product that is available everywhere. 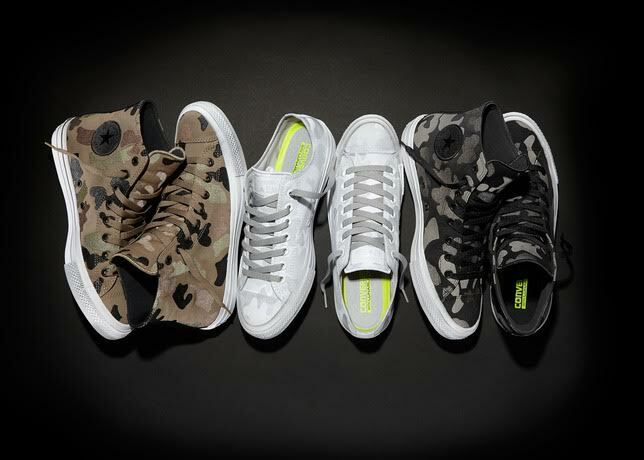 For instance, last year, Converse had launched its Chuck Taylor All Star II Reflective Print Collection. Unfortunately, FLF was late to bring the collection to India, and instead launched it this year. “The number of consumers who know internationally that Converse has launched Chuck II, and that there is a camouflage range out is amazing. I’ve got people texting me asking if the camouflage Chuck II range has reached. So consumers who know it, know it,” says Aggarwal. India has become an important market for Converse. It has understood that India, as a market, can’t be behind the rest of the world. With China slowing down, the growth is here. “Last year they felt we could do it (launch a collection) a year later. This time we said it’s not going to happen. India gets it at the same time, or skips it. Because when you follow social media, I know what’s happening everywhere,” says Aggarwal. The Boston, Massachusetts-based Converse Inc., is a wholly owned subsidiary of NIKE, Inc. The 108 year old brand has built a reputation as ‘America’s Original Sports Company,™ and has been associated with shoes such as the Chuck Taylor® All Star® shoe, the Jack Purcell® shoe and the One Star® shoe. Today, Converse offers a diverse portfolio including lifestyle men’s, women’s and children’s footwear, apparel and accessories and is sold globally by retailers in over 160 countries. In India, Future Lifestyle Fashions Ltd (FLF), is the brand licensee and has been managing the brand since 2009. The company has been solely responsible for marketing the brand in India, and for ensuring a top of mind recall in a competitive market. Converse is available in the key metros including Delhi NCR, Mumbai, Bengaluru, Pune, Hyderabad, Chennai, Ahmedabad, Guwahati and Mohali. So who is buying Converse shoes? According to Aggarwal, CEO, Indus League, division of Future Lifestyle Fashion, Converse is not a male brand any more. The consumer has changed. Many women and tweens are buying the shoes. So, sizes are getting smaller. There has been a huge change in the consumer’s lifestyle over the last couple of years. The whole world of formal and casual is breaking up. The youth segment is finding its own genres and dress codes. Atheleisure is taking over as a dress code. Even hairstyles are radically different from five years back. Youngsters sport tattoos and piercings. It might look rebellious, but it has all moved beyond the rebellious. w the sports business, and brought in brands like Converse, Champion and Umbro. In 2013, the Future group undertook a group wide internal restructuring, consolidating the group’s small businesses into three main legal entities – Future Lifestyle Fashion, Future Retail and Future Consumer. Future Consumer is the food space which comprises all the work the group does in food parks and all the brands in the food space. Future Retail comprises primarily Big Bazaar and other formats within the group such as e–Zone and Home Town. Future Lifestyle Fashion became a consolidation of the group’s retail businesses such as Central, Planet Sports, Brand Factory and all the brand businesses. By this consolidation, all the brands were moved out of retail to be managed as brands, and retail was left to be run as pure retail as an arm’s length transaction. What used to happen previously is that Converse was sold as part of Planet Sports in all the Centrals. So Planet Sports used to be in Central and there would be Converse inside it. This has changed. Instead, now, each brand has its own dedicated section. So there will be a Converse section, a Champion section and a Umbro section. “A person is coming to buy each brand,” says Aggarwal. “So in the process of the next six months in every Central across the country, you can actually go and buy Converse and not a `shoe’,” she says. The brand’s first global identity store was launched November 2015 at Ambience Mall in Gurgaon (NCR). Its second exclusive store was launched recently at Chennai’s Express Mall. Plans are to redo the Infinity Mall, Malad, store in Mumbai to the new global identity. Plans are to open a store in Dehradun, West Bengal. Besides being a young market, Aggarwal feels North East India is more fashion conscious than the rest of the country. “The fashion sensibility is different in the hilly regions,” she says. And of course, there is online sales. Future Lifestyle Fashion’s turnover is expected to be around Rs3,500 crore this year. For Converse, the company is looking at almost 40 per cent growth in the coming year. “The last year has been about consolidation, setting things right, moving to global line. We have stopped doing a lot of India sourcing. We have become global, because that is what we think the Converse consumer is looking for,” she says. In April this year, the new global line was launched the Converse Chuck Taylor All Star II Reflective Print Collection. “I think there is a deterring customer who is willing to pay for the right product. I’m not saying people are willing to buy expensive things. People are willing to pay for what they believe is the right value, whether the value is in the brand name, or whether the value is in the design, is up to each person’s perception and what they are willing to pay,” she adds. Being a youth centric brand, Converse gets interwoven into the lifestyle of the customer. Converse Inc.’s property, Converse Rubber Tracks, is one way that the brand connects with its customers. “This is a great property to allow us to become a part of their lifestyle,” says Aggarwal. Converse Rubber Tracks is a global family of community-based professional recording studios. Emerging musicians of all genres can apply for free studio time. If selected, artists record at no cost while maintaining the rights to their own music. In India, Converse has developed the platform as The Road to Converse Rubber Tracks. Since its first edition in 2014, it has become a hugely successful platform that gives independent bands / artistes in India an opportunity to fulfill their dreams and cut a record of their own. Being a property that was developed around the brand thought, the brand’s creativity and the brand’s connection with the youth, Aggarwal thought all of that was valid when one is trying to build a brand. “This is not a brand that you can build by just advertising. You have to get into the lives of the consumer,” she says. The first edition of The Road to Rubber Tracks in 2014 exceeded everyone’s expectations of what was possible to do in India. It gave a platform to The F-16s, an electro-indie band from Chennai. The winner of the second edition earlier in April this year, was Guwahati-based rock band Dosser’s Urge.